reopen the 2nd at 9 am. We are sorry for any inconvenience. We strive to provide complete care for our parents. Learn more about all the services we provide. Call us at (904) 683-8444 today. Vision care is an important part of your family’s health care. It all begins with prevention. 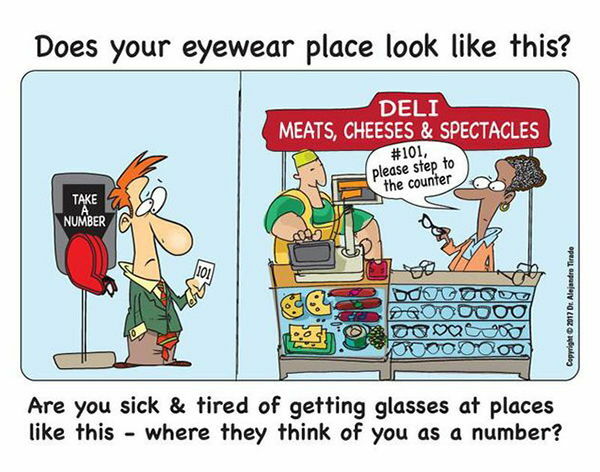 An annual eye exam may detect vision problems or medical conditions. Early treatment may slow down or even prevent deterioration of vision. 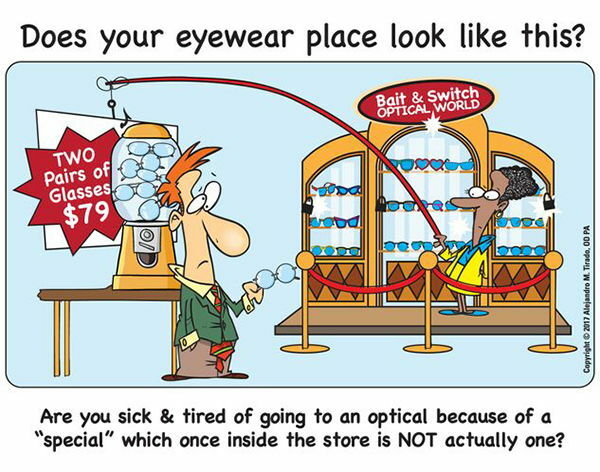 We want to make your choice is simple and be your Jacksonville eye doctor. Our services are designed to help you manage all your eye care needs in one place. Since 1990, Dr. Allan Tirado has served families in Jacksonville and its Beaches treating their eye care needs for children and adults. Eye Care For You is a full service eye and vision care provider, accepting both eye emergencies as well as scheduled appointments. Patients throughout the Jacksonville area come to Eye Care For You because they know they will receive the personal attention and professional care that is our foundation. Dr. Tirado and our team are dedicated to keeping our patients comfortable and well-informed at all times. 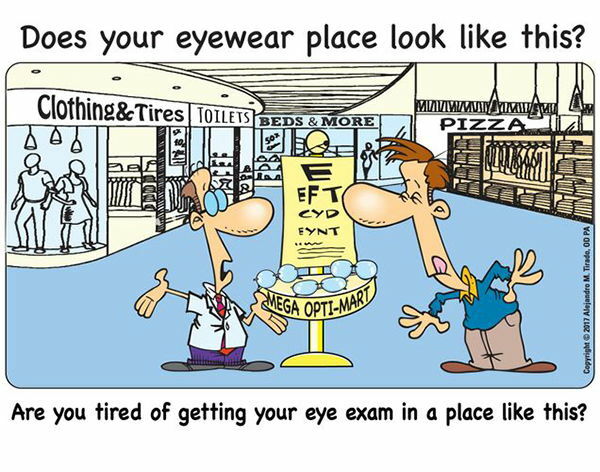 At Eye Care For You, we will explain every exam and procedure and answer all of our patients' questions. Additionally, at Eye Care For You, we offer vision financing options and will work with vision insurance providers to ensure good eye health and vision care for all of our patients. 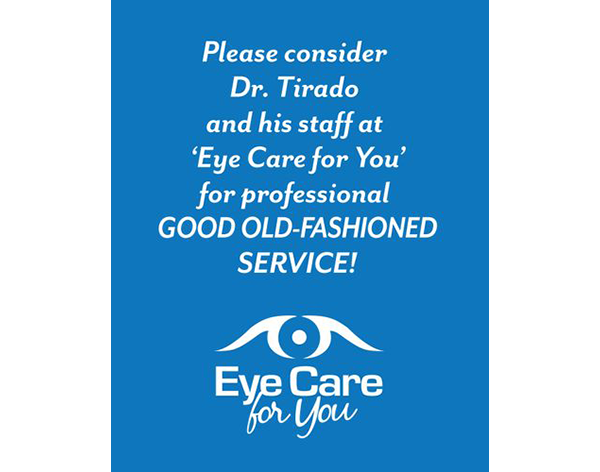 Our one-on-one approach to optometry makes Dr. Tirado and the Eye Care For You staff the eye and vision care providers of choice in the Jacksonville area. Our Jacksonville optometrist offers the following services: complete eye exams, contact lenses, glasses, glaucoma testing, and pre- and post-operative care. For a complete list of services, visit our services page or call our Jacksonville office at (904) 683-8444. At Eye Care For You, we are dedicated to providing high-quality optometry services in a comfortable environment.Call us at (904) 683-8444 or schedule an appointment today online.